Demon – Try it, you’ll love it! 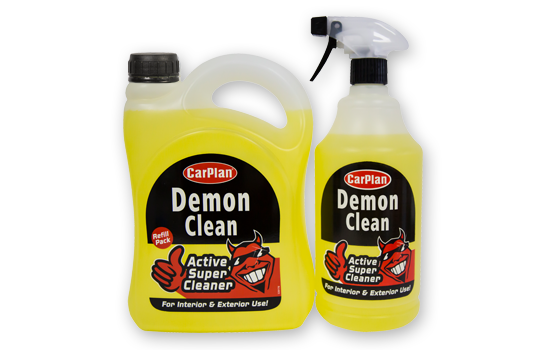 CarPlan Demon Range covers everything you would possibly need to fully valet your car from roof to tyres. Easy to distinguish from other CarPlan products, our colourful range will leave a lasting impression as well as wonderful fragrances. 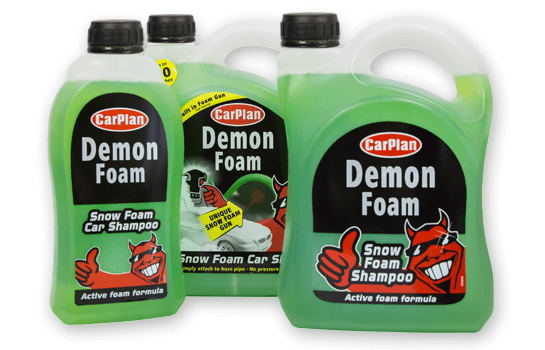 Within the range comes our patented Demon Foam, which coats your vehicle with a thick layer of snow foam. 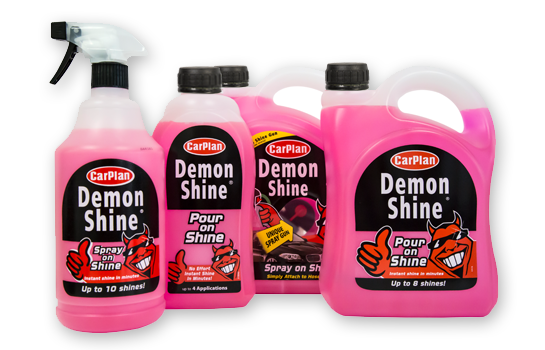 Once the car is dry, CarPlan Demon Shine can be easily applied covering your vehicle in our patented Demon Shine formula, giving off that just waxed finish in a fraction of the time and without all the hard work! With an amazing cherry fragrance, our patented Demon Snow Foam, generates a dense foam that is easy to set up and use whilst relying only on standard household water pressure. 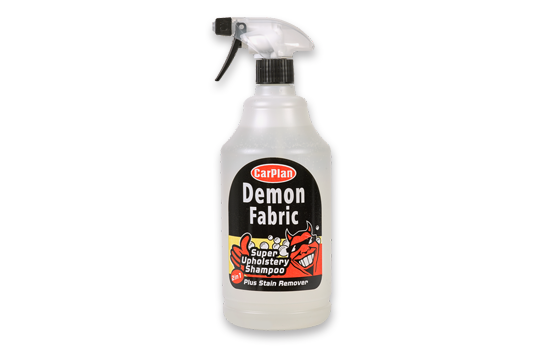 Demon Foam effortlessly lifts dirt and contaminants from the surface and the high performance detergents powerfully remove all traces of traffic film, dirt and grease, leaving a spotless, streak-free and shiny finish. Our cherry fragranced top gloss treatment provides a just waxed finish without the hard work! No hard rubbing or polishing, just a mirror finish shine that lasts for weeks. Use on paintwork, wheels and bumpers. The unique Multi Purpose Cleaner can be used to clean interior and exterior surfaces of the car. Interior Uses include the dashboard, windows, plastic trim and other hard surfaces. General Exterior Uses include plastic and trim surfaces. The citrus fragranced formula works by effectively removing dirt, grease and grime leaving a pleasant aroma. 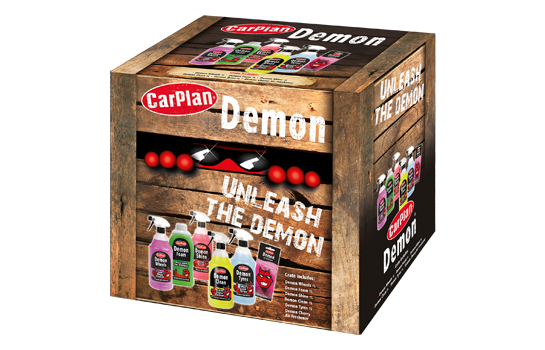 The Demon Gift Pack contains everything you need to clean and shine your car. 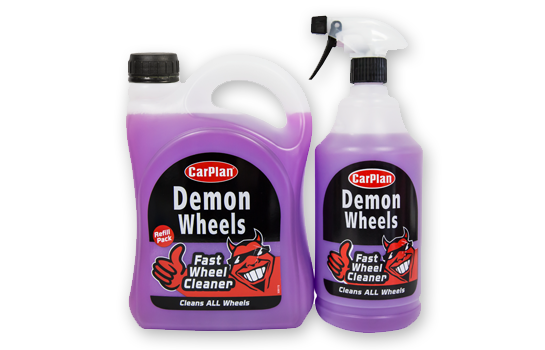 This kit includes all the Demon essentials to wash, clean and shine your vehicle bodywork, before applying the finishing touches by leaving your wheels shining clean. 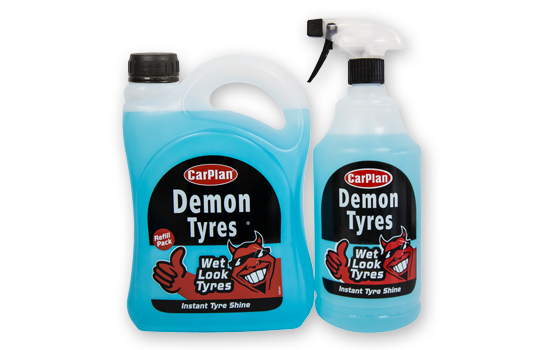 The kit contains: Demon Foam, Demon Shine, Demon Clean, Demon Wheels, Demon Tyres and an air freshener. Universal wheel cleaner formula is safe to use on any wheels including chrome, plastic, alloys and split rims. The fast acting formula removes baked on brake dust, road grime and oil quickly. Simple spray on action! A silicone free tyre shine for wet look tyres, The easy one step action provides shine and protection that lasts. The no wipe formula leaves a long lasting wet look that seals in shine! Want the best showroom finish for your car in a fraction of the time? Let the Demon do the work. A fabric cleaner to remove tough dirt and grime from all seats, roof lining and trim panels. 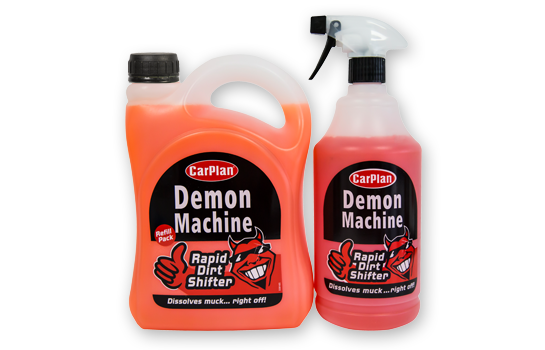 CarPlan Demon Fabrics fast-acting formula penetrates and lifts the first and grime whilst leaving a fresh linen fragrance that helps mask stale odours caused by food, tobacco and pets etc. Why not compliment your range of Demon Products with a variety of Demon accessories? Demon air freshener holds the same, long lasting, sweet smelling cherry fragrance that Demon Shine does, whilst giving you that Wicked Demon look! 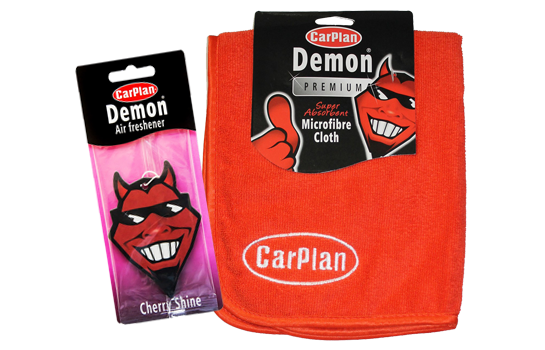 Demon Premium Microfibre Cloths are suitable for valeting and household use. The microfibre construction is highly absorbent and super soft will not scratch any surface. Just attach it to your hose, select foam and foam is what you get. Works best when rubbed in with a cleaning brush. Work one area at a time, if you cover the whole car by the time you get the brush the foam runs off on to the floor. I’m still testing the up to 20 washes, (I say ”I” but i mean ”my husband”). He is up to 10 and feels there is going to be plenty enough to get the 20 for the car and bike. Rather than use a car wash I prefer to clean my car myself. It is good exercise and although it takes longer than putting it through a car wash at least I know that I have done the job to my satisfaction. This pre-wash degreaser (Demon Machine) is great. I spray my car panel by panel leaving each for about five minutes before washing the panel with a wet soft cloth (I like large microfibre clothes). Nearly all dirt and grime is easily wiped off. If the vehicle has not been washed for sometime it may require a repeat but in the last four years I have only had to do that once after not cleaning the vehicle for more than six months. Once the vehicle has been treated in this way it is ready to use more elbow grease – waxing and polishing. After spending a couple of hours work I think you will be very, very happy how good your car looks. I have bought Demon Shine previously and was very impresed with the ease and speed it was possible to get a good shine. The added benefit is you just wash it, spray it on, (I do all over in one go), and polish off with a microfibre cloth. Polishing the car now takes only a few more minutes than washing it. Spraying it on the alloy wheels helps keep brake dust at bay too. After rain, the water beads on the surfaces as if it has been polished with some of the more traditional products. Overall – it does what it says on the tin – highly recommended and job done in minutes!